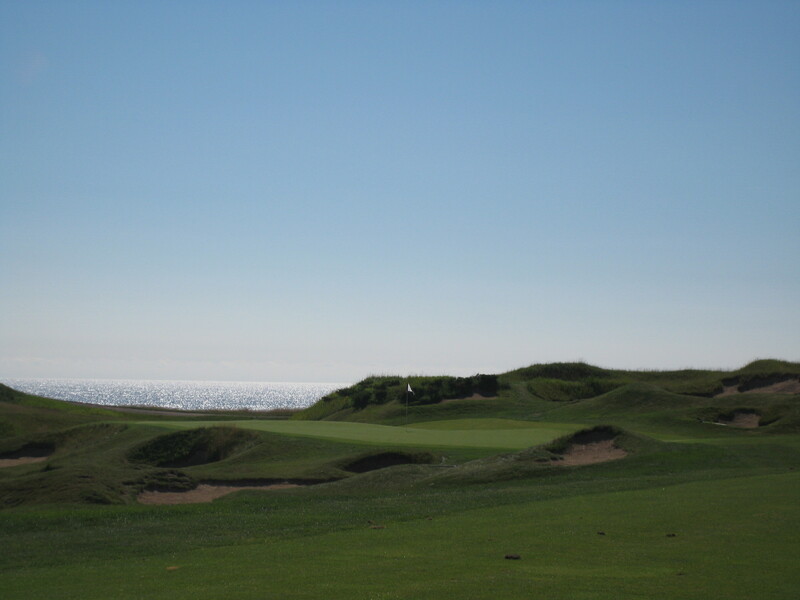 The Irish at Whistling Straits sits close to Lake Michigan with the Straits course between itself and the shores of the lake. As a result it lacks the links style character of the Straits, it does not have the vast wild look set among the rugged dunes areas strewn with hundreds of small bunkers and natural grasses. Rather it is a cute sister with a unique personality of it’s own. 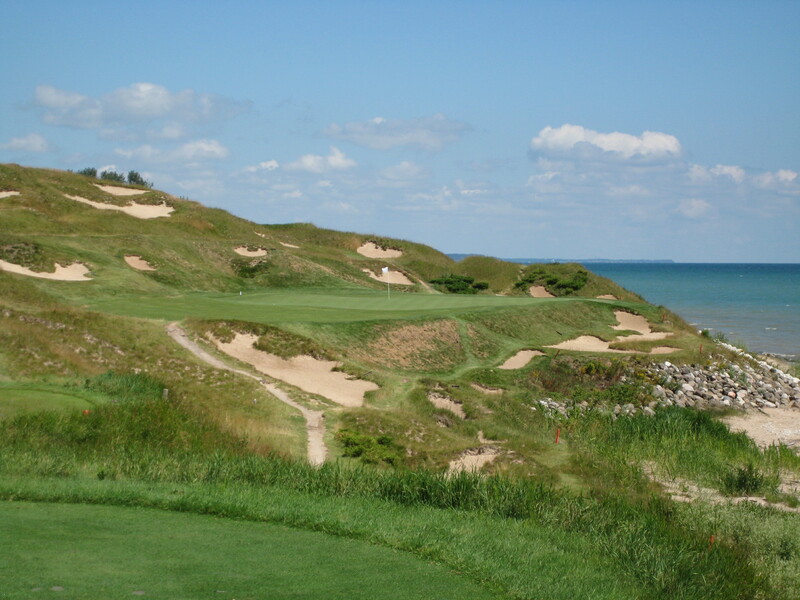 Pete and Alice Dye sculpted the land to create a very original blend holes that share the influence of the Lake Michigan winds in a more parkland setting. There is a bigness to the scale of this course-the engineering feat and tactical drama they created easily equals that of the Straits it just does it in a slightly more demure way. The Irish has a more manicured look with smooth edges and curves. Much like Pete’s work at TPC Sawgrass there are more defined water hazards and vast manicured waste bunkers here that create distinct target areas collared by strife. The pressure is constant from the very first hole to make precise tactical decisions and execute specific shots. Mistakes translate into scorecard cash register ringing, so you are going to have to be on your game to protect your score from disasters. Once you have been through the course the first time, I think the shot lines are much less psychologically intimidating since you are better aware of the bordering parameters. Over the long haul your scores should be improve as a result. Every Dye course I have played has the “startle factor” and this one is no exception. You stand on the tee of many of the holes and think “Wow!” usually followed by “Oy Vey!”. He just has a way of laying holes out that are so splendid to the eye with the flow of the fairway, demarcation of the hazards, and uniqueness of the green complex presentation. At the same time you cannot help but feel intimidated by what he is apparently asking you to do. But, as with TPC Sawgrass, if you keep your wits about you, I think there is a fair and conservative line you can choose on every hole that is not an unreasonable challenge. Playing to your handicap is very doable on this course. The three pars lack the stunning beauty of those on the Straits because they do not have the cliff hanging green sets against the lake backdrop. But the four pars more than make up for this drama through a very clever use of segmentation of the landing areas and sharp turns in the doglegs. Greens are very large, segmented, and have plenty of pitch and roll to them so you have to be very articulate in your approach shots to avoid lots of three putt drama. The biggest factor to your scoring will be the wind effect off the lake in conjunction with the large waste bunkers and water hazards adjacent to the driving areas. There are a number of partial forced carries you have to calibrate properly to minimize your risk. It is the cumulative effect of having to deal with this hole after hole that will wear on you. This is a wonderful golfing challenge dressed up with splendid visuals. In the end the Irish will not assault your scorecard as directly as the Straits, but the net result is likely to be the same-a feeling of exhausted accomplishment after a day of sensory overload. 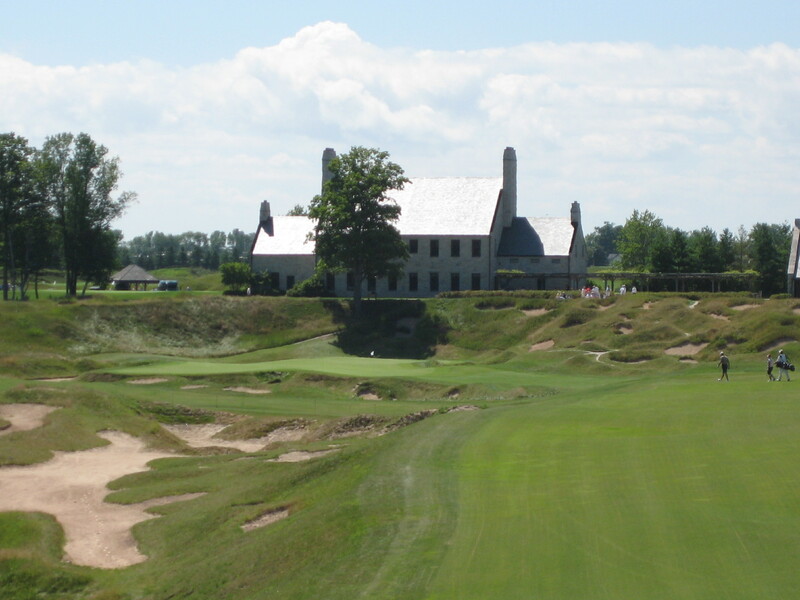 The Kohler/Whistling Straits resort is something to behold, it has first class accommodations, great food, wonderful service, and four, count em, four Pete Dye golf courses. But the thing that put this place on the map is The Straits course which has already hosted two PGA Championships, a U.S. Senior Open, and will be the host of another PGA in 2015 and the Ryder Cup in 2020. There are two things that are startling about The Straits. 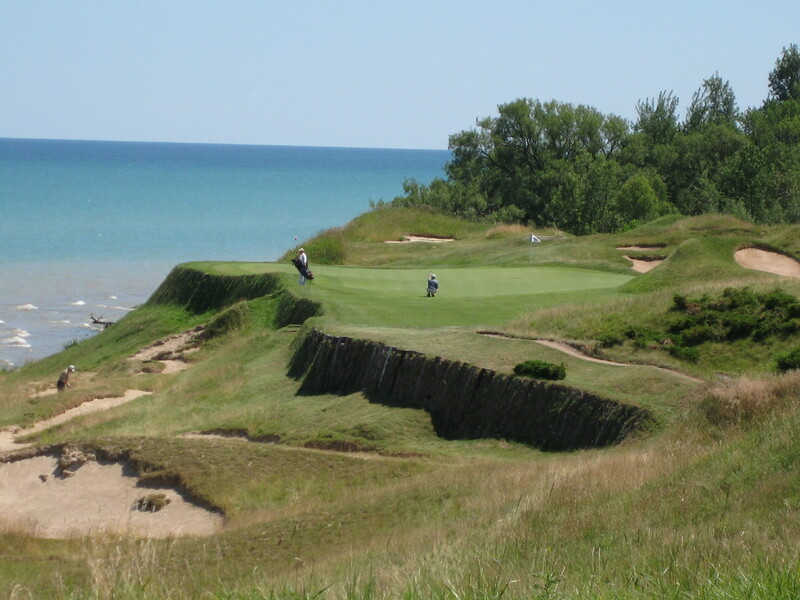 First it is essentially a links style course in the middle of America and second, everything you see that makes this a links style course, except for the ocean sized Lake Michigan over your shoulder, was manufactured by man. The not so startling fact is that Pete Dye had the audacity to conceive and pull off the first two. 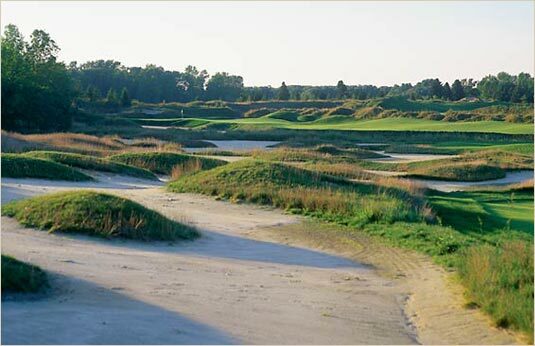 The fact that he was convinced he could create a links style layout from scratch with office building sized sand dunes, massive waste areas peppered with endless bunkers, and acres and acres of native links type grasses on what was essentially a pancake flat piece of lakeside ground, formerly an air force target range, is beyond audacious-it was almost egotistical. But Pete has never suffered for lack of self confidence and damned if he did not pull it off. 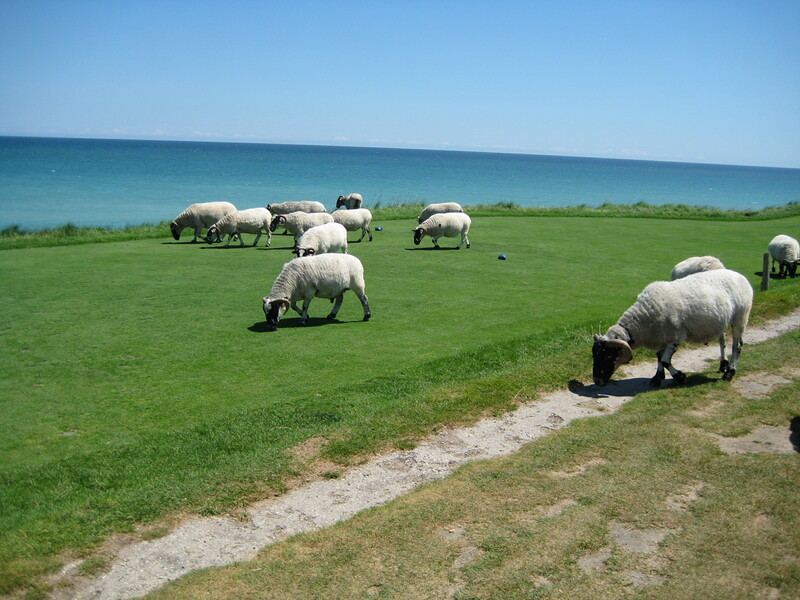 He even has the signature sheep wandering the course to make it feel like you are playing an old links course in rural Ireland. They may be cute but they will mooch your peanut butter crackers. 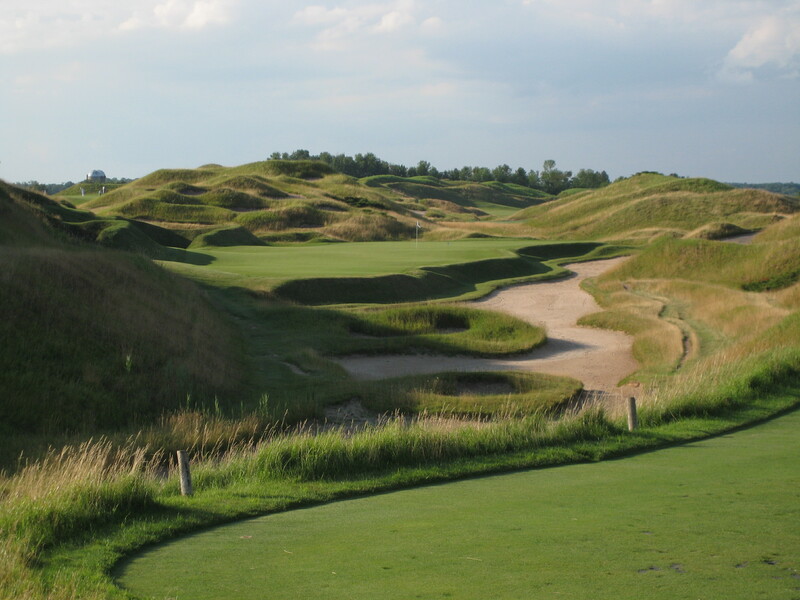 Besides the engineering feat of importing and placing about 8,000 truckloads of dirt from Indiana to sculpt the land, Pete had to conceive of a routing to expose as many of the holes as possible to the lake winds to create the real look and feel of links golf in Wisconsin. It is a figure eight routing with the front nine going south along the lake shore and then looping back upon itself to catch more shoreline on the way back in. The back side does the same thing going north along the shoreline and looping back for more shore on the way back to the clubhouse. This puts 8 of the 18 holes with direct interface to the lake and another six within eye view. The influence of the wind off the lake can be profound and since the holes go in both directions on both sides you rarely get but a couple of holes in a row with the same wind effect. The quiet tranquility of Number 2 is beguiling. Pete did his homework and integrated many of the important strategic links characteristics so that the course can be challenge no matter the wind direction and you have a chance to be successful as well. As with most links courses these greens are very long which allows the greens staff to place the pin on the front when the wind is in your face or in the back when the wind is helping-this will make it easier for you to use the green surface to manage your shot into the green. Most of the 500 bunkers are well out of the playing area but the positioning of ones in the driving areas, layup areas, and greensides are staggered so that there always seem to be tactical bunkers in play no matter the prevailing wind. There is open access at the front of most greens to give you the bump and run option if a lower approach shot is in order. The only failing is the turf is not as firm as you expect on a links course so sometimes those bump and runs will bump and check. Most significantly, the towering dunes and massive waste areas adjacent to the fairways and greens create visual intimidation that make TPC Sawgrass look tame. This psychological collateral can be very significant if you let yourself get too fearful of playing the right shot. Seventh Hole Par 3 is pure intimidation. The par threes on this course are all stunners-forced carries over huge waste areas to precipice greens with the backdrop of the lake behind. This lack of topological backdrop can make frame of reference of the shots hard to discern. The wind influence on the three pars is at it’s max because they are the most exposed holes on the course. There are a number of serpentine par fours where Pete used the large dunes to obscure your vision of the target-this is especially true if you hit your drive on the wrong line on the doglegs. The way he wends these holes through the dunes and sets the green complexes against massive backdrops and falloffs creates that links feeling of risk and reward on almost every shot. It takes some moxie to play this course successfully. The harsh reality of Number 17 will challenge you. The greens are massive and have lots of slope and tiering. In many cases being on the wrong section of the green is like not being on the green at all. You have to resist playing to the safe side on many of these holes otherwise you will be three putting all day long. Green speeds are affected by slope and grain, but wind is not to be forgotten because it can accentuate the curve and speed of a putt drastically. The caddies here are top notch-they are truly professional caddies who understand the course and the tactics for playing it successfully. Heed what they say and ask lots of questions-you need to hit every shot with full confidence out here if you want to play to your handicap. Don’t forget where you are-I recommend the kilbasa at the turn with some kraut-it is almost indigenous to the region. 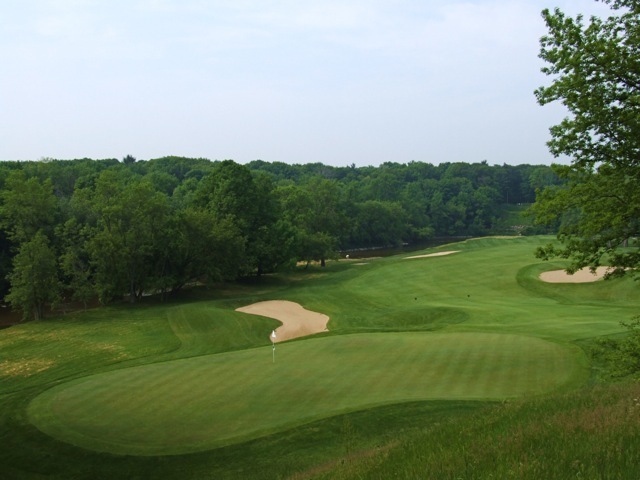 This was the first of the championship layouts created by the Kohler people in this remote area of Wisconsin that have helped define this place as a major golf destination resort. 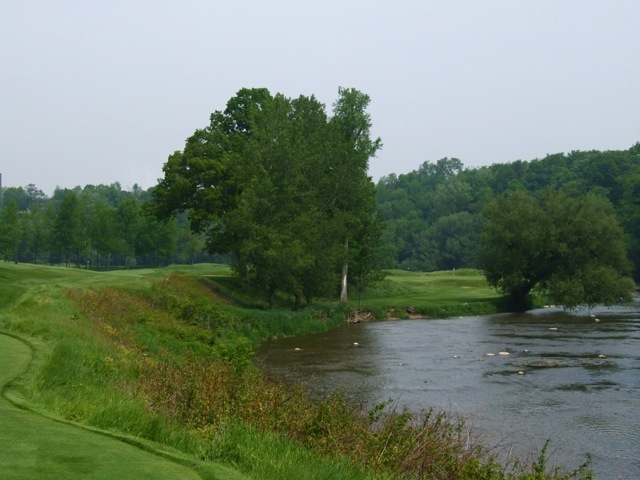 Pete Dye put the full force of his creative juices to work in creating this parkland gem that weaves among the tributaries of the Sheboygan River. For three years (1995-97) the World Championships Match Play was played here and in 1998 the USGA held the Women’s U.S. Open on this course which was won by Si Re Pak in a memorable playoff over an unheradled amateur Jenny Chuasiriporn in a 20 hole playoff on Monday. The Women’s U.S. Open will return here in 2012. Truth needs to be told-the course for these championships was made up of nine holes from the River Course and nine holes from the Meadows Course that shares this property. 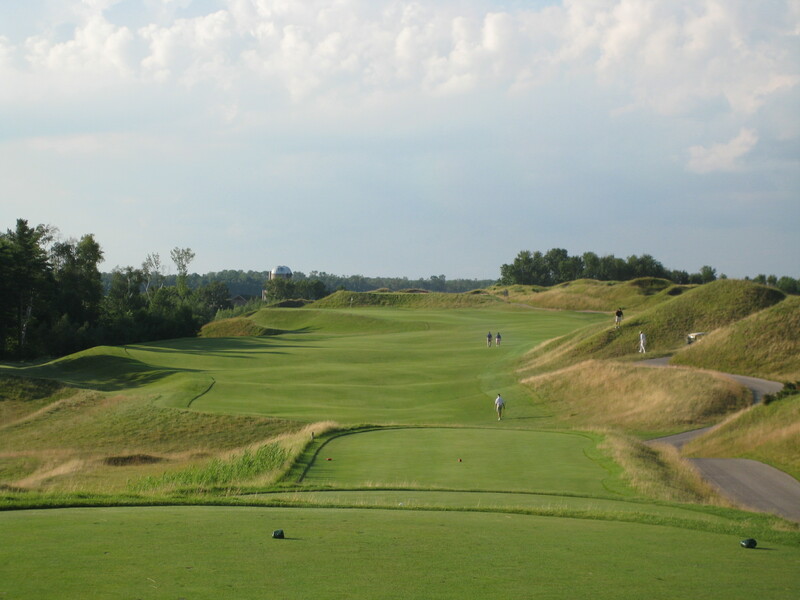 As with all the courses at Kohler it is extremely important for each player to play at a tee length that is comfortable to them otherwise the task at hand becomes impossible. 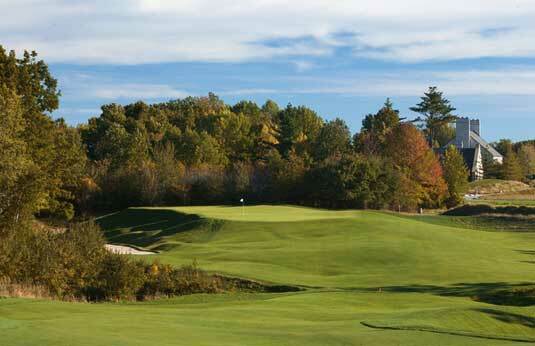 The Blue Tee works nicely for a 6 to 14 handicap who can carry their drive over 200 yards. Par is 35-37-72-only one par 3 on the front which makes for an odd sequence rhythm. If the wind is blowing this course will be incrementally more difficult. In typical Pete Dye fashion lots of psychological havoc being presented-but a very playable and definable line of play on each hole if you pay attention and can ignore his attempts to intimidate you. You will have to be on your game to score well but a reasonable score is attainable with proper restraint from trying to do more than you are capable. Put your ego away-there are doubles and triples that will appear on your card-but the satisfaction of good scores on particular holes should be enough gratification to make this a golfing experience to remember. As we do on links courses-play a match-that way no matter how bad your medal score you can still have success out there in beating your opponent. The greens are very undulating and quick-you have to carefully consider where on the green to hit your approach or you will be three-putting you score away. Driving areas are often confined by hazard on one side or by harrowing topography so it will take some articulate driving-with a bit of bravado to get the best angle of approach to some very challenging green settings. The bunkers are deep-deep so you have to have real trust in your 60 degree and play for the putting surface not the flag out of the greenside bunkers. There are major distances between greens and tees but they do provide shuttle service in season. I think this is a course to walk if for no other reason to take in the full flavor of the asthetics of the course and have proper time to plot the strategy of your next shot.